Ox Tail saber (Niu Wei Dao). The blade has a pronounced curve, widening towards the end then tapering to the tip. 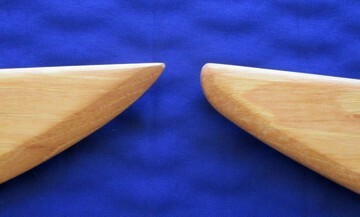 Blade width – 1-5/8″ at the guard. Avg. point of balance – 6″ to 7″ from the guard. Blade length Choose an option25"26"27"28"29"30"
SKU: 140. Category: Dao. Tags: Kung Fu Broadsword, Niuweidao, Ox Tail Saber, tai chi sword, taiji sword, wood tai chi saber, Wooden Saber, wooden sword, wooden swords, Wooden tai chi sword.